In all aspects, Ann Arbor condos have seen an increase in pricing compared to last year. Comparative to July 2017, the amount of new units listed is increased a staggering 61%, from 59 condos to 95 entered this July. The average listing price has also greatly increased from $278,100 to $415,405 since last July, which is a considerable 49.4%. 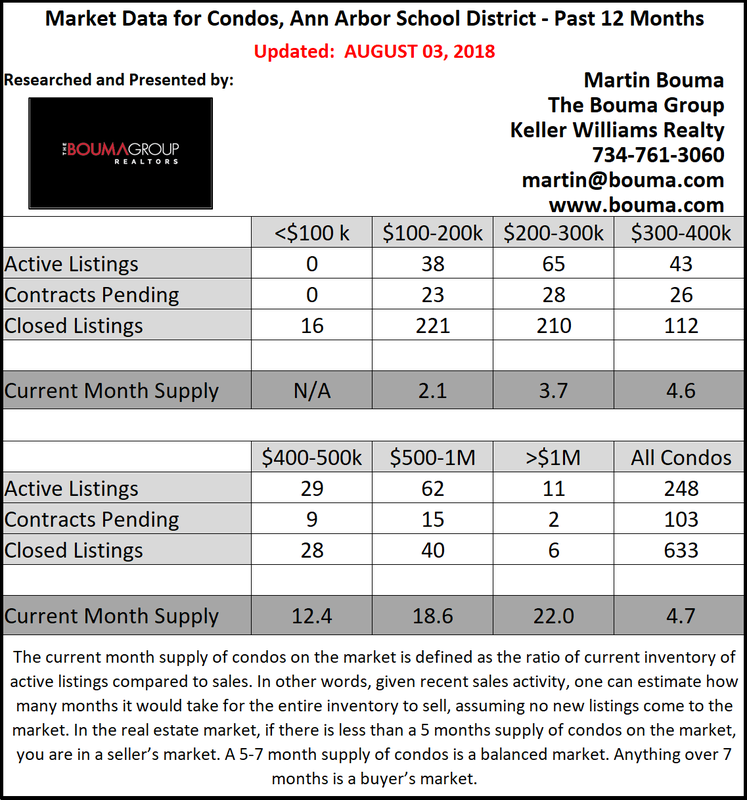 Despite the dramatic rise in available inventory, the difference in amount of sales has increased only a mere 3% compared to the prior July, 62 sold condos versus 64. Sale prices, however, have managed to ascend from $248,766, on average, to $323,768. The difference in average sale prices for July between this year and last is 30%. On average, condos are on the market for 16 days. Looking at year to date statistics, there has also been a rise in pricing. So far this year, the average listing price is $355,552, and this is a 21.5% increase in comparison to the ALP of $292,734 at this time last year. In Ann Arbor, 503 condos have sold thus far versus 488 in July 2017; this creates an increase of 4.1%. Unfortunately there has been a 21% decline in the amount of sold units thus far in 2018, from 386 sold condos to 305. The average sale price for condos so far this year is $290,733 which is a rise of 16% in comparison to last year’s ASP of $250,719. Overall, it is a seller’s market for Ann Arbor condos, especially for more affordable condos sold under $400k. Condos that are more than $400k are considered to be part of a buyer’s market though. Ann Arbor condos are very close to being in a balanced market, which would be more favorable for both sellers and buyers. Whether you are looking to buy or sell a condominium, contact the specialists with The Bouma Group at (734)761-3060 or email info@bouma.com. For more updated knowledge on the Ann Arbor market, check back here!